LESS USE OF 450 METRES. Now that listening to broadcasting has become popular, the interests of the “listener-in” have become increasingly important, and here as in other parts of the world those who control the commercial use of wireless are taking as much care as is practical to see that wireless telegraphy does not interfere with broadcast reception more than can be helped. Much interference is at times experienced from the use of ship-transmitters operating on a wave-length of 450 metres, which is rather “close” to some of the broadcast wave-lengths, and arrangements have been made, and are nearly complete, providing that vessels shall not use this wave-length until they are 400 miles from any portion of the New Zealand coast line. This virtual removal of the 450-metre wave will prevent a great deal of annoyance now caused by the breaking in of Morse signals on broadcast reception. 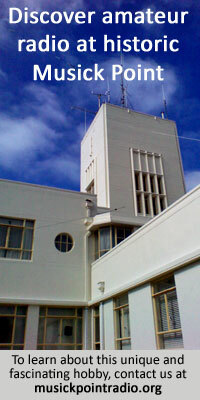 A good many of the public are not aware that the P. and T. Department carries on its shipping station work upon what is known as an extended range, in addition to the sharp transmissions made in and around the coast of New Zealand. Vessels coming from Panama to New Zealand can be reached through the Chatham Islands station six nights before their arrival in New Zealand. This, however, involves a relay fee in addition to the usual coast station charge, but as soon as ships come within reliable working range of Wellington coastal station the relay fee for working through the Chathams is dispensed with and the ordinary, single charge is made. Messages are then transmitted direct by the Wellington radio station, although a vessel may be from 800 to 1000 miles distant. Wellington-San Francisco boats and vice versa are kept in direct communication, from and to Rarotonga. This means six nights out from New Zealand, and six nights before arrival here. There are sometimes exceptionally severe atmospheric conditions which prevent working at these extreme ranges, and on these occasions vessels are advised as within range as soon as they can be reliably worked. Such occasions are, however, very rare. Vessels on the intercolonial run are worked direct all the way to and from Australia from the Auckland, Wellington, and Awarua radio stations, and most of them are in communication during daylight as well as the dark hours.